Posters showing a portrait of Turkish President Recep Tayyip Erdogan and reading "Wanted," "Erdogan, Turkey," are left after a protest at the Turkish Embassy in Moscow, Nov. 25, 2015. The news that a Turkish fighter jet downed a Russian plane Tuesday could signal a further slump in Turkey's already sluggish economy. The country is trying to balance its two-pronged war with Kurdish militants and Islamic State fighters in Syria with rapidly increasing tensions with Russia, the country’s No. 2 trading partner. Russian Prime Minister Dmitry Medvedev has warned that Turkish companies could lose projects and markets. Such a warning is all too real for Turkey’s economy, says chief economist Inan Demir of the Istanbul-based Finans Bank. "Russia is Turkey’s more important export market, and the other is the tourism channel, about 11 percent of the incoming tourists to Turkey are of Russian origin. And there could be drops in both exports and tourism numbers," said Demir. 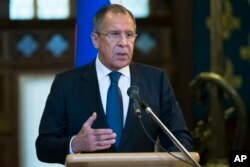 Russian Foreign Minister Sergey Lavrov on Tuesday warned Russian tourists to stay away from Turkey because of what he says are terrorist threats. Tourism numbers are already down over fears of Islamic State attacks and renewed fighting with the Kurdish rebel group the PKK. FILE - Russian Foreign Minister Sergey Lavrov speaks at a news conference in Moscow, Russia, Nov. 4, 2015. On Wednesday, Lavrov said Turkey's downing of a Russian fighter jet will change the countries' relationship. Tourism accounts for more than 10 percent of the Turkish economy; but, it is Turkey’s reliance on over half of its energy from Russia that poses potentially the biggest risk, warns international relations expert Soli Ozel of Istanbul’s Kadir Has University. "Somehow, the gas pipelines may have accidents or they may need repairs that may last 20 days in the dead of winter. Fortunately for Turkey, because the Russians these days are in dire need of money, I don't think they would want to do that either," said Ozel. Russia’s energy company, Gazprom, earns more than $27 billion in foreign currency from Turkey; but, analysts point out Moscow has in the past shown a willingness to sacrifice economic considerations for wider strategic goals. Economist Demir warns the risks to Turkey are considerable. "Turkey has some backup plans for sure; but, it is very difficult to make up for the loss of energy supplies in a short period of time, so the impact there would be very difficult to quantify but certainly sizeable," said Demir. Possibly mindful of an approaching winter, Turkey’s political leadership is reaching out to Moscow for a de-escalation of tensions. The joke on the streets of Istanbul is the best investment to be had is shares in the manufacturers of warm jackets and coats.